KALI chronia: happy new year. Greece starts 2014 with an unaccustomed run of good news. Not long ago the country was in a death spiral of missed fiscal targets, panicked markets and threats to force it out of the euro. Now the euro zone’s first and most difficult problem child is exceeding expectations. Ahead of schedule, Greece has closed its scary deficit and moved into primary budget surplus (ie, before interest payments). Yields on ten-year bonds have fallen below 8%, from a peak of well over 40% at the height of the Grexit panic. The government plans to issue fresh debt later this year. Some foreign investors are testing the waters of the Aegean. Competitiveness is being restored. Greece has enjoyed a bumper tourist season. This year should see the first GDP growth after six years of recession. 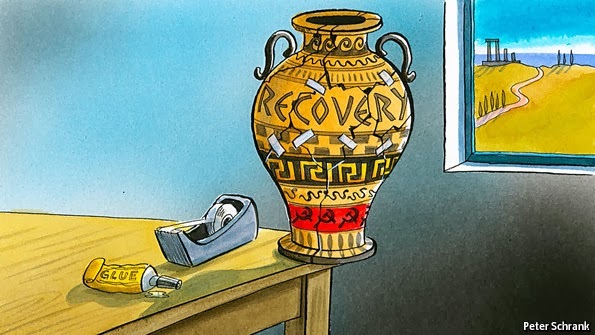 Once-exasperated German officials now hail the Greek prime minister, Antonis Samaras, as the saviour of his country—and, indeed, of the euro. As Greece assumed the half-yearly rotating presidency of the European Union this month, EU dignitaries came to Athens this week to praise it, not to bury it.